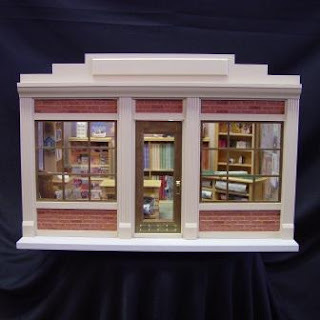 About Jeepers Miniatures: A Miniature Quilt Shop at Jeepers! A Miniature Quilt Shop at Jeepers! Two-day workshop during which we will create a miniature quilt shop in a roombox. Materials and instructions for making a fabric bolt rack, magazine rack, fabric bolts, fat quarters, faux quilts, magazines, and a few simple accessories are included in the cost. A roombox, student's choice of wallpaper and flooring are also included. A list of additional supplies and materials will be provided at registration. Class date: June 11 and 12, 2011 starting at 10 am (till about 5 pm) each day. Class Cost: $155 (Registration and $75 deposit is required by May 28, 2011). Class size is limited to 6 students. Click here to register today. Join us for a fun mini project that you can complete in the weekend!